Doodlebug Design Inc Blog: FRENCH KISS Cut Files | GIVEAWAY!!! 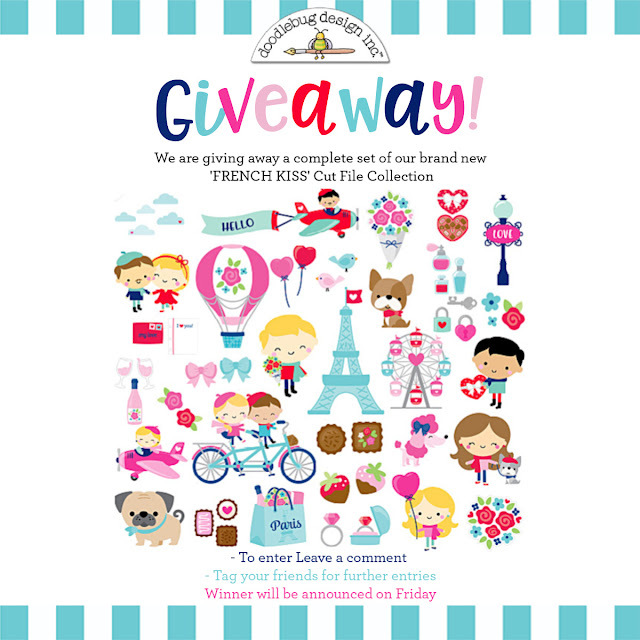 FRENCH KISS Cut Files | GIVEAWAY!!! Our French Kiss cut files are done! They will be available in the next couple of days at so keep checking! In the meantime, we are having a giveaway of one complete set! Love the blues in this fun palette. Thanks for the chance to win. Yay! I do believe this is my favorite collection yet!!! Woohoo! Can't wait for the files to hit the store. Thanks for the chance to win! These are all so adorable! So many cute images. Such a sweet collection! I love making Paris themed cards. Oh my! This is beyond too cute! The colors and the doggies! Love it lots! Love the Eiffel Tower and the colors are fantastic!!! So cute! You make adorable images! Thanks for a chance to win! I LOVE EVERYTHING Doodlebug! Thank you for the chance!!! I love Doodlebug and would love this collection. The French Kiss collection is my favorite! I love the new Cut Files! They are soo adorable. Thanks for this chance to win!! Such a Sweet collection! I would love to win this which I would use to make cards and some projects for happy mail!! This is so adorable! It makes me want to go to France! Love to have the SVG files for this adorable set!! I want to make some of those cute little guys BIG!!!!! Oh my goodness!!! I live Paris!!! This collection is wonderful!!! Adorable collection! So sweet and fun! Wow, the whole collection? What a great prize. Thanks for the opportunity to win. I love it! Can't wait to make the Frenchie card. Thanks for the opportunity to win this great set! So cute collection!!! I love it!!! Thanks for a chance to win. Super cute! LOVE the doggie one! Thank you so much for the chance to win! Wow the new French Kiss Collection is sooo beautiful! I love the Paris theme tied into it. Wonderful job Doodlebug Family. This is my favorite new Doodlebug collection and will pair so well with my upcoming trip to Paris!! Am in love with your talented designers' work and inspiration!! Can't wait to get my hands on it and start crafting away!! Am wanting to make scrapbook layouts, cards, and of course a cute mini album!! Am so enthralled with these adorable icons of the couple on the double bike, effel tower and Paris bag, Hot air ballon and planes, and all the Frenchie pups!! This is magnifique! INTRODUCING "Simply Spring" | + GIVEAWAY!!! Introducing DOODLE STAMPS & DIES | + GIVEAWAY!!! A New Year | A New Team!